I've been gutted since yesterday, after hearing the news about Talia Joy, whose YouTube tutorials taught me how to blend eyeshadows. If you haven't seen them, you should - here they are. This is my all-time favourite tutorial from her (click here). I shall remember her every time I blend my eyeshadows. I hope she is happy and pain-free now. This heartbreaking video was her last. Her story makes me contemplate on how we can possibly indulge in strife over trivialities, when her family has just lived through the greatest nightmare ever - the loss of a child. But Talia would not want us to grieve; she would want us to wear makeup and talk about makeup. I have a couple of manis planned for her. 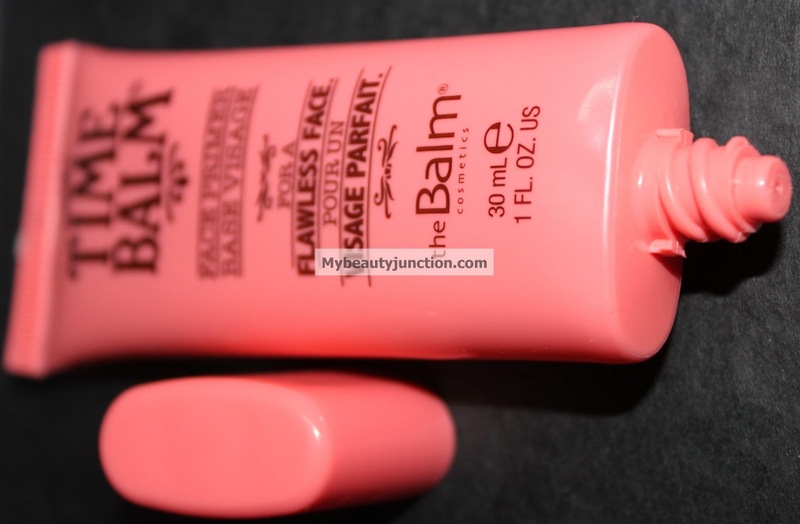 Anyway, here is a review of the Time Balm primer. Yes, I am obsessed with TheBalm, especially after their new website launch and 50% off sale in early April. Quality product meets whimsical packaging is a winner for me. Plus, no parabens! Ever. I bought the Time Balm after reading that The Muse loved it. Packaging: Orange and I usually never get along. I'd say the packaging is alright. IMO, TheBalm could have taken a leaf out of the "Put A Lid On It" eyelid primer (review later) and done a cute design here. I like tube primers, though; I don't have to keep dunking rather soiled fingertips into pots or hunt around for a spatula. Formula: Siliconey. But The Muse said this was a siliconey product she didn't have issues with, so yay even for those with cone-allergies. Claims to be fortified with vitamins A, C and E. No parabens. It looks colourless like MUFE's All Mat, but it is thicker and less watery. Imagine Porefessional without the colour - same thickness. Application: Best results with finger-application. I think the warmth from fingers does a better job at blending this primer than a brush or blender sponge. Blends out nicely into a velvety-smooth finish with no pilling at all, over serum and moisturiser with SPF. Mattification: Instant. Does a fabulous job of hiding pores and evening out the face. Feels light and non-cloggy, and you won't have to clean out the gunk at night. I don't know how this will work on dry skin. Staying power: As good as Porefessional. Better than almost all others I've tried. Keeps my makeup on all day, irrespective of whether it is liquid, cream or powder. One touch-up of mattifying powder around lunchtime. Comparison: I think Porefessional brightens out the skin tone more than this. And TimeBalm is less expensive. Apart from that, I can't think of differences. You can buy this primer from theBalm's website (ships worldwide). P.S: A bunch of us are going to be doing a mint mani on Friday in honour of Talia, on our blogs. If you would like to join in, please let me know and I'll tell you where you can post it.